I walked another few miles while watching “My First Socks” through Lesson 3. First, how adorable is Lucy Neatby? Top of the scale, right? She is covered with color, for one thing, from her hair to her clothing. I can’t see below her waist, because of the desk, but I’ll bet my stash that she has something amazing on her feet. And, I could listen to her voice all day. Why does everything sound better with a British accent? 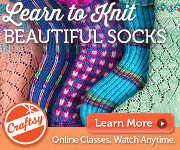 This class isn’t just for knitting a first sock, I’ve decided. The instruction and photography are so clear that I think someone could LEARN TO KNIT from this class. Lucy doesn’t assume anything, she spells everything out. Classes are interactive, but I’m interested to see what questions knitters might have. Seems to me that she thought of everything. One thing I found interesting is that Lucy starts the pattern for k2, p2 ribbing in the middle of the 2 knit stitches. So, it would be *k1, p2, k1*, rep to end. This does aid in lessening any gap at the beginning of the round, so I can see the advantage there. And, she makes a point of noting that the first st on every needle should be a knit stitch (so much easier, and I do that, too. Now I am wondering if I figured that out on my own, or learned it in the long-ago classes I took from Lucy. Hmmm) But, I generally think of k2, p2 ribbing as *k2, p2*, and it is pretty ingrained. I thought her take was interesting, though. She thoroughly covers knitting with dpn’s (which she calls “rigid dpn’s” to differentiate them from circulars, which she calls “great big, floppy dpn’s”. Made me laugh!) , knitting with 2 circular needles, and knitting with one very long circular needle. She mentions that when knitting with 2 circs, you need to make sure you knit with the end of the needle of the sts you are working with. One thing I would add is that I use 2 dift needle brands, so that the needle tip and/or cables look different. This way I can easily tell them apart. In Lesson 3, Lucy found a dropped stitch! I loved this, because I have found some knitting mistakes while teaching in my classes, also. Hey, YOU try to knit perfectly when trying to teach while being filmed. Lucy, of course, turned this into a teaching opportunity, demonstrating the ease with which dropped sts can be dealt with. Lucy also introduces her signature “Happy Stitch” concept in this lesson. I was very happy that she used the term “link” for the joins between stitches. Hooray for links! Memorable quote from this class session: “Don’t worry about dropped stitches. You have to practice dropping stitches like everything else”. So true!